Hi Folks..!! I’m again back with another Reliance Jio Sim Usage Trick. 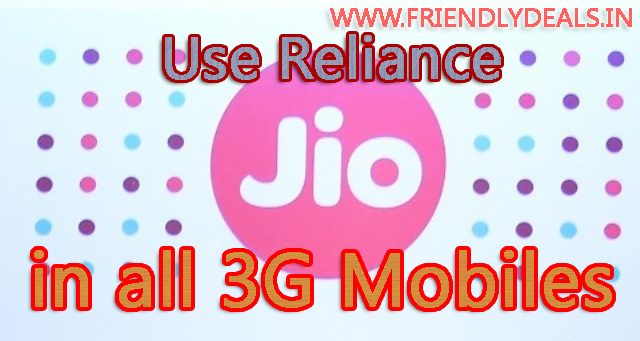 Using this Simple Trick you can Use your Jio Sim in any 3G Mobile Devices. But Let me Warn you, you need to be very careful or Cautious when following this Trick. As you will be Changing the Default Network Parameters by following this Trick. So It causes anything unusual or Brick your Phone or any kind of other losses, I’ll be not Responsible at all. Do on your Own Risk if you want to be. Hey Bro, Before Going into More Details I Need Your Small Help. I’ve Just Started my Blogging Journey. But I’m very Dedicated with my Work. So to Stay in the Competition, I Request you to Share my Articles in your Facebook or Twitter or Pinternet Handles. I’ll be Glad to you. And You’ll Find my Friendly Deals Facebook Page on the Sidebar. Please like it if you find our Articles Helpful & want to be Connected with us in Future also. Though the Trick is Very Much Easy and Should work without any Issues at all. Maybe you’ll not get very High Speed using a 3G Device. But If you don’t own a 4G Device, then you might want to try this Trick atleast Once. Please Note: You can Only Use Internet Using this Trick. You can’t Call Because Calling Needs a VoLTE Device. Firstly You need to Download the Engineering Mode App from Playstore. After Download Completed, Open it and Select MTK Settings -> Select Preferred Network Option. And then Restart you Mobile. Now Enter your Reliance Jio Sim Card in Slot 1 and Leave the Slot 2 Empty. Select Reliance Jio as your Preferred Sim for Data Usage. Update your ROM to a New Custom ROM(CyanogenMod Preferred) if you don’t find the LTE Network Band in MTK Engineer App Settings. Samsung 3G Mobile Users also can update their Default ROM to a Custom ROM like CyanogenMod then Dial *#*#4636#*#* to Enter in to the MTK Mode & then you can able to Change the Preferred Network Band to 4G LTE.